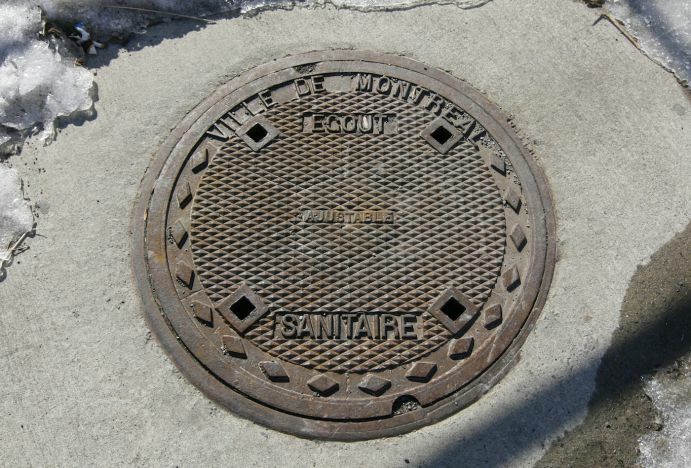 I ‘m going to go out on a limb here and assume that manhole covers aren’t things that most people pay much attention to. I can’t blame them. I probably wouldn’t give them much thought either, but because they often play an essential role in allowing me to get inside the places I go, I find them a bit difficult to ignore. Even when visiting other cities and have no intention of going underground, I’m still looking at the covers, hoping to catch a glimpse of something unique to the area or to get an idea of where things lead. I can’t help it. It’s a curse. So on the off-chance that anyone else is interested in these sorts of things, I decided to put together a bit of a guide for the most common ones here in Montreal. 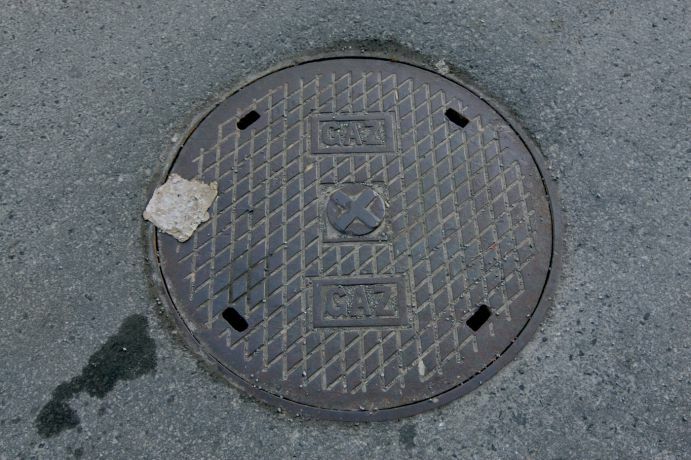 And please, no “man hole” jokes. I’ve heard them all before and only eight of them are actually funny. 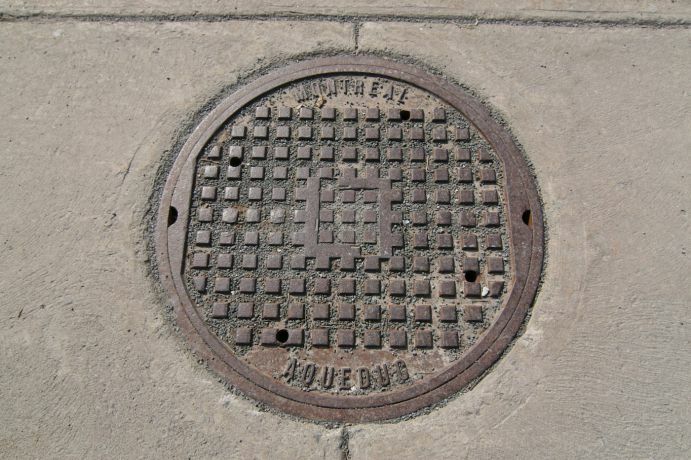 For a city that often prides itself on being creative and open to the arts, it’s a bit surprising how little effort Montreal has put into the visual design of its manhole covers. If that seems like an odd statement, consider how other cities such as Vancouver, Seattle, New York and Tokyo have commissioned works from various artists for theirs. Not surprisingly, the results are often quite striking. Montreal, on the other hand, seems to have settled for a fairly bland and generic system for marking things. 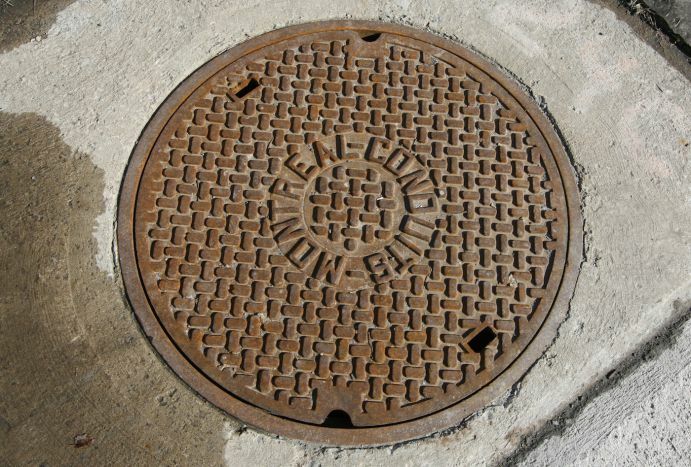 If you’ve never noticed manhole covers here, this is probably the reason why. With that in mind, let’s have a look at what Montreal has to offer. 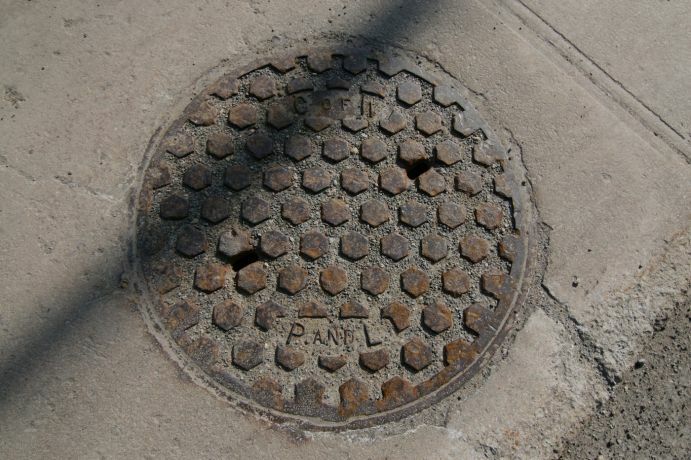 These days, there are two basic types of sewer manhole covers: one set for use out in the middle of the streets and another set for use in pedestrian areas. Both have fairly large square holes which aids proper airflow and ventilation through the system, both are very heavy, and in dire need of some dressing up. 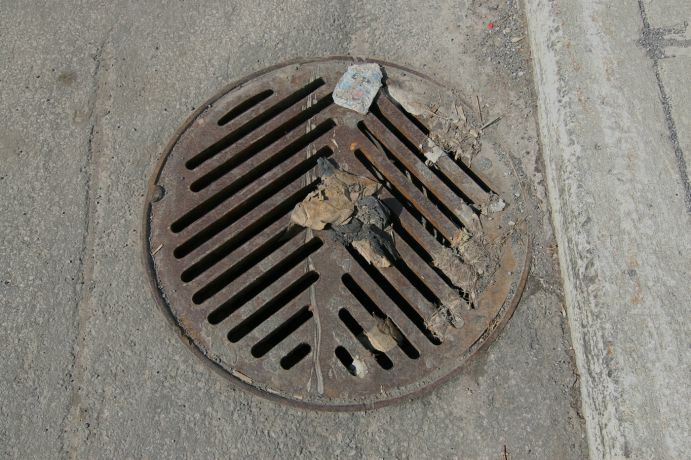 An example of a typical lid found on busy roadways. The fine cross-hatch pattern helps reduce noise levels (and aids traction) as cars pass over them. I imagine it must prevent a fair amount of unnecessary tire wear as well. The covers often have “adjustable” or “auto-adjustable” written on them. 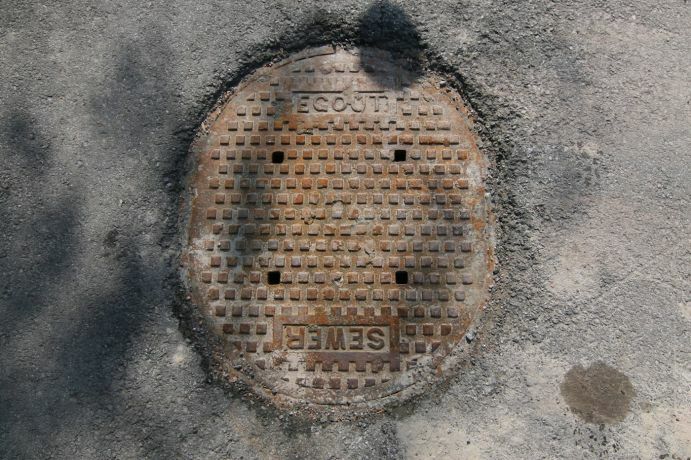 It refers to how the lid can be raised or lowered to be kept level with the pavement after roadwork occurs. The decorative diamond pattern around the outside edge is about as fancy as they get. Sometimes the wording changes slightly, but that’s about it. 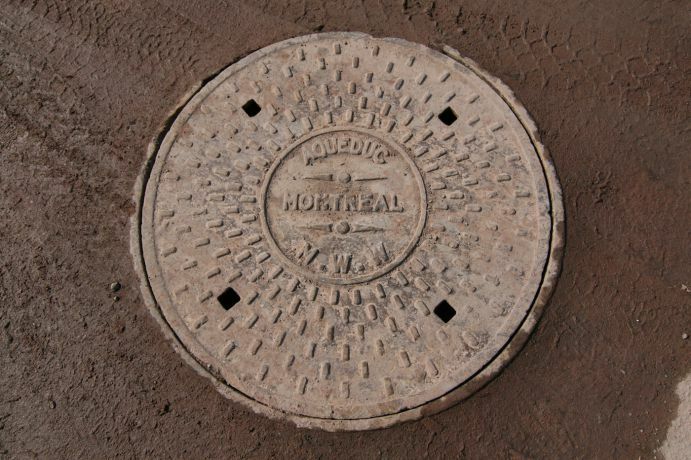 Though not technically covering manholes, you’ll find catch basin covers on pretty much every street, parking lot in Montreal. 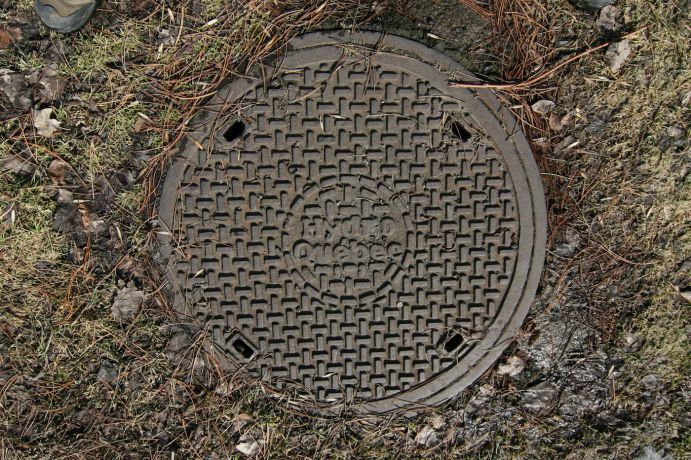 They’re designed to collect and transfer surface runoff into the sewer or stormwater system while keeping out larger objects like trash. If you’ve seen one you’ve seen them all. Really, the only interesting thing I can say about them is that the groves are always positioned in a way that prevents bike tires from getting caught in them. 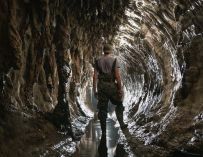 Much of downtown Montreal has its electrical system running underground as opposed to over tr. The lids sitting above the maintenance chambers for this system containing either cables, fuses, transformers or circuit breakers are easy enough to spot. 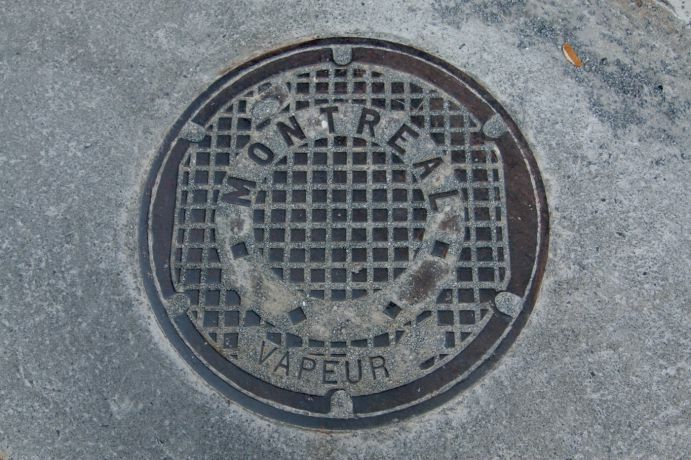 They’re labeled “Montreal Conduits.” They’re fairly large and are most often found alongside sidewalks or in close proximity to buildings. They almost always have the same “woven” design with some minor variations with the placement of ventilation holes. Similar in size to the electrical conduits, are the maintenance vaults for Bell’s communication services. 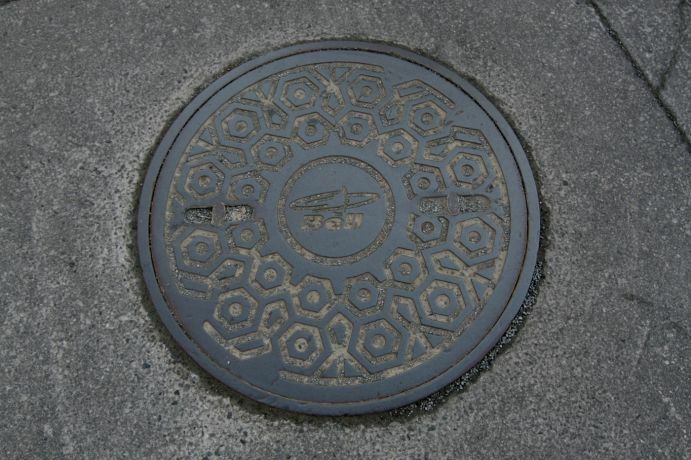 They’re easily recognized by their hexagon pattern and a Bell logo (either old or new) stamped into the middle. 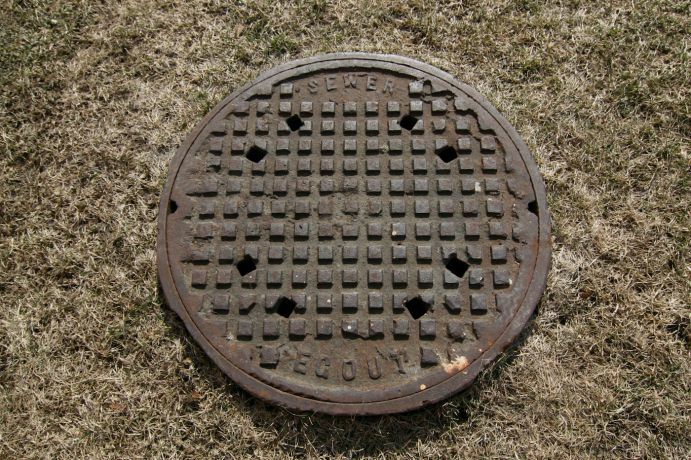 It’s a pretty standard design that can be found in other cities across North America serviced by Bell. You’ll find these either on sidewalks or out in the middle of the street. 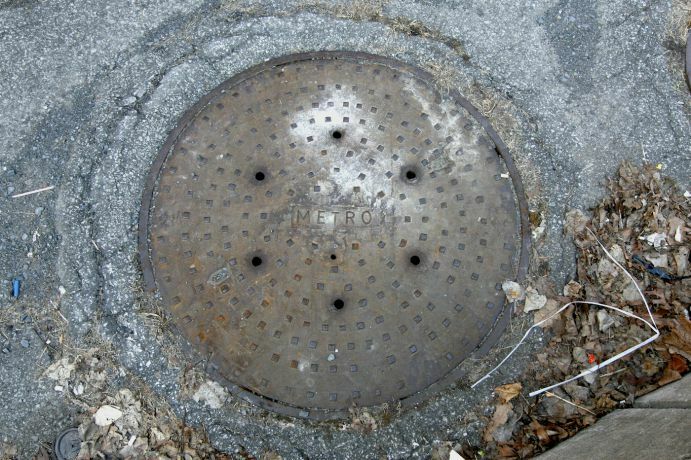 These lids generally sit atop a small chamber that allows for inspection and maintenance of the city’s drinking water system. They’re easy enough to spot from a distance by the square piece that sits in the middle. At first I thought the square part was ornamental, but it turns out it’s purely functional. It can actually be pulled out, which presumably allows workers to open or close a valve without having to remove the lid entirely when water is bursting everywhere. 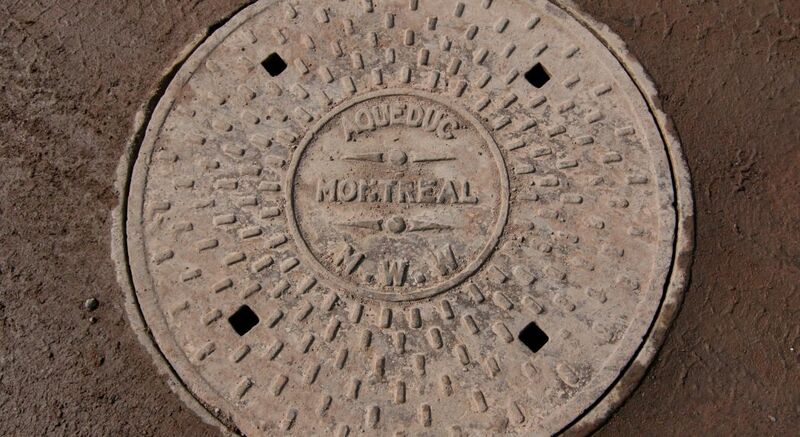 You can find these on just about any street in Montreal as well as in several other communities around the island. 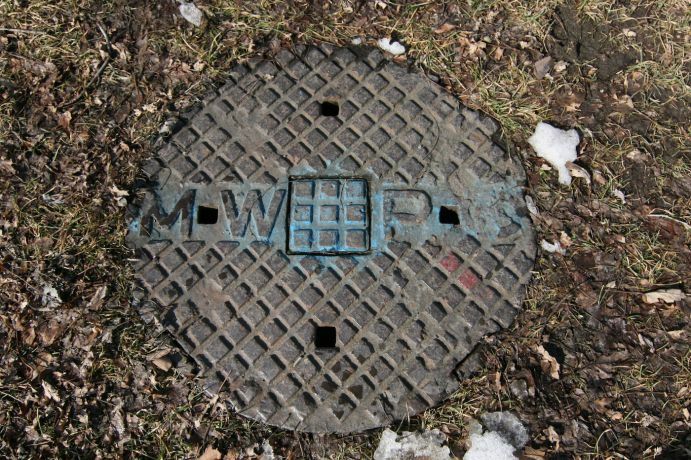 The MWPC (Montreal Water & Power Company) helped establish Montreal’s first long-distance network of watermains during the late 1800s. 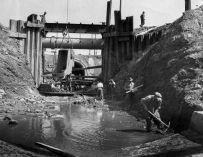 The company was eventually expropriated by the City of Montreal in 1928. 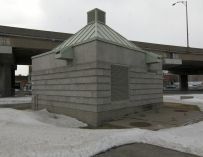 This particular one can be found adjacent to the Cartier Monument alongside Parc. So I guess that just about (ha ha) covers it. Know of any other interesting ones in Montreal or elsewhere? Let’s see them! Excellent post! It would be nice to something a little more flamboyant for a design. I was touring the sites for history on St.Henri, Montreal. Notre Dames st., St.Antoine and St.Jacques St. I came across this site and was very amazed what interest people have. 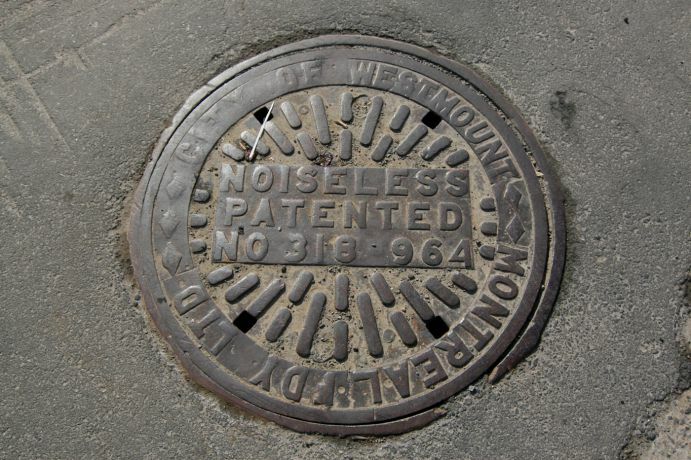 Sewer lids through the years is an interesting topic. Imagine if they were taken care of in cleaner fashion. Guess not eh! That would something for fairyland. Lovely photo. Excellent research and article! Thanks for sharing all your work! I remember about 1959-60 when very deep shafts were dug at points along Westbury Ave., presumably for the `snow drains` which run north and then west along Vezina to the water catchment under the park at the corner of McLynn Ave. Although I believe the plowing of snow into these drains has long since been discontinued, the large oblong metal shaft covers still exist on Westbury just south of de la Peltrie and on Vezina east of Mountain Sights Ave. 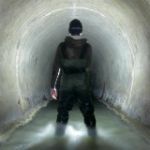 I wonder if these shafts are worth the risk of exploring–if indeed it is even possible to do so. Aug 10, 2010 … People seem to really be interested in ex-Bell city manager’s $800000 annual salary–recently adjusted up to $1.5 million with benies…. Jul 28, 2010 … How might an individual earning close to $800k as a city manager live? Let’s learn more about former Bell, CA city manager Robert Rizzo.